Back in June, to mark the Queen’s official 90th Birthday, our pupils designed cards for her Majesty. One card was chosen from each Year Group which all the pupils in that class signed. The cards were posted to Buckingham Palace. 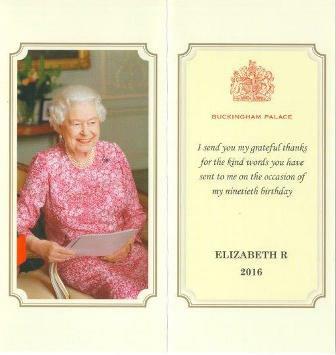 We were delighted today to receive a thank you letter from Buckingham Palace together with a card from her Majesty stating her grateful thanks for the kind words sent to her on her ninetieth birthday.